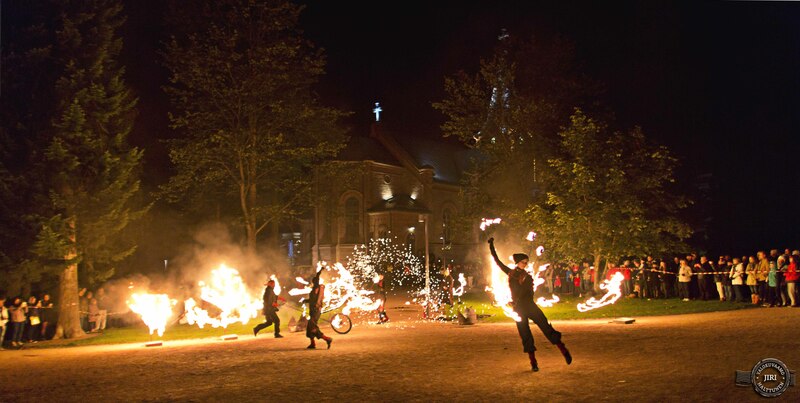 Located right in the heart of Finland, the City of Jyväskylä has hosted the City of Light event each autumn since its inception back in 2003. This year’s event, staged from October 1st-3rd, formed part of the programme for IYL 2015 – the UN’s International Year of Light and Light-based Technologies. Maria Baric Company: Ave Fenix -fire puppetry & circus show. Credit: Jiri Halttunen. To mark the International Year of Light, as part of the event a seminar was organised in cooperation with the University of Jyväskylä, The Finnish Association for Teachers of Mathematics, Physics, Chemistry and Informatics MAOL ry as well as amateur astronomers – the theme of which was naturally light. The subject was examined from a number of different perspectives, such as the history of light, light and the cosmos, and light and energy. The seminar also provided fascinating insights into Aurora Borealis – the Northern Lights – as well as an introduction to astronomy as a hobby. The lecture hall attracted an audience of almost 200 people interested in the theme who were quickly enchanted by light in all its forms. At the City of Light event temporary lighting installations created especially for the occasion occupy centre stage. Their role is to bring light closer to ordinary people and to create opportunities to experience and see light as part of a harmonious urban environment. Light artwork commissioned for the event is combined with other elements such as performing arts, music and even parkour. In addition proceedings include a wide variety of interesting supporting events and happenings, at which it is possible to learn new things about light and to experience its intriguing effects. The programme this year featured among other things workshops, guidance on home illumination, light adventures in a theme park, fire show performances, collaborative activities and of course environmental, media and light art. Participants were also granted a fascinating opportunity – to enjoy dinner in a restaurant with their food served in complete darkness by blind waiting staff. In addition to the temporary light installations and support happenings the purpose of the event is to showcase models of successful lighting solutions – in other words to show off new permanent illuminated locations which have taken shape in the city over the course of the year. They now number almost one hundred in total. These permanent illuminated locations are places we normally associate with the city, such as bridges, parks, buildings and works of art. The large number of permanent illuminated locations leaves its own mark on the way the city looks during times of darkness. Indeed Jyväskylä nowadays enjoys a reputation for its lighting. This year a new innovation among the permanent lighting solutions was push button control of LED floodlighting at the sports ground in Muuratsalo. The lights burn at 10 per cent power and then increase in brightness for two hours at the push of a button. In this way users can control floodlighting at the ground for themselves. This is particularly important in winter, for instance, when there is natural daylight for just a few hours each day. The lights are, however, fully extinguished in the middle of the night. The public transport experiment tried out for the first time last year was repeated; to mark the event the public transport authority in the Jyväskylä Region granted everyone the chance to use the buses for free across the whole urban network each and every day during the event from six in the evening until midnight. This boosted the number of people using public transport by roughly 135 per cent compared to normal. What is more, research indicates that air quality in the area covered by the city improved during the experiment, meaning the venture was a considerable success. 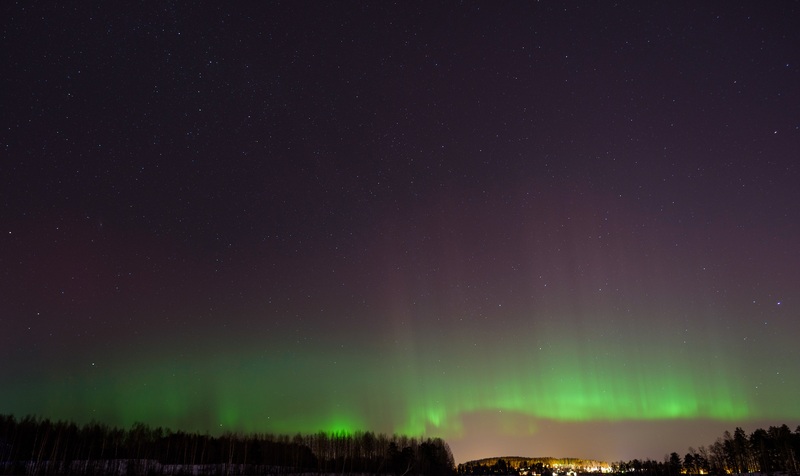 Northern lights in Jyväskylä. Credit: Atacan Ergin. A medium-sized city by Finnish standards with a population of 136,000, Jyväskylä has taken light to its heart. This year over 30% of the region’s inhabitants took part in the City of Light event, which underlines the fact that people really get going in large numbers in order to enjoy light in all its dimensions as the autumn darkness sets in. The people of Jyväskylä take pride in their superbly illuminated city and for this reason experience a great deal of pleasure in their living environment too. Nowadays lighting is one of the most important focuses of urban design. It permits a safer, more aesthetic and energy efficient environment for each and every one of us. Light also has a very humane influence, since it is a fundamental right of all. In Jyväskylä, for instance, various population groups, associations and other players at grassroots level have actively developed content linked to the theme of light during the course of the event. At this event communality, tolerance and light combine in a natural manner – resulting in something we can all enjoy, together. 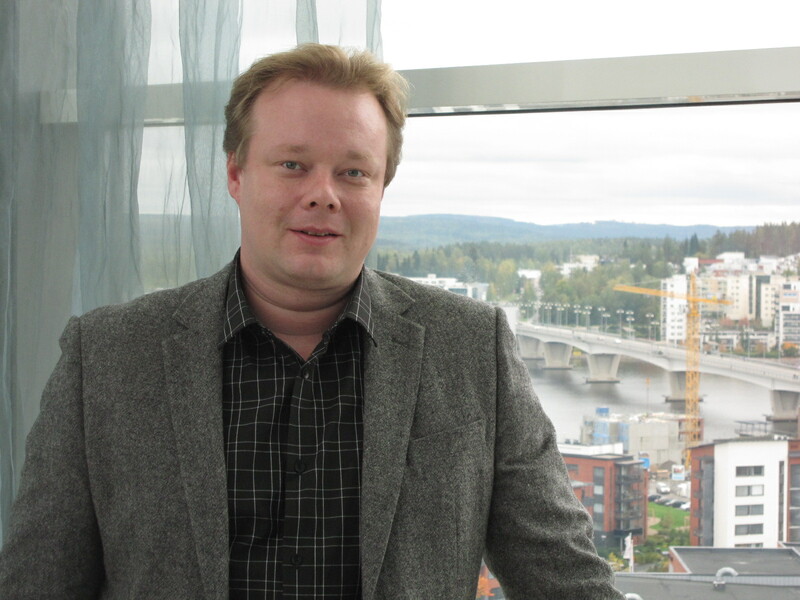 Jani Ruotsalainen has coordinated the City of Light project for the City of Jyväskylä since 2004. His tasks include the production of City of Light events, communication and PR, partnerships and other development projects associated with City of Light. His employment history is defined by solid experience in the tourism business and development of the same in the role of entrepreneur, financial director and expert adviser in different organisations.